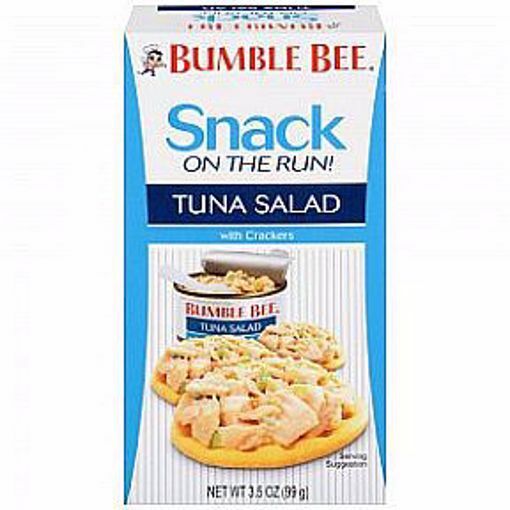 3.5 oz box containing 2.9 can tuna salad and crackers package. 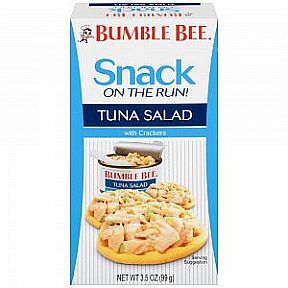 ingredients: tuna salad - tuna (light tuna, water, vegetable broth, salt), heat stable mayonnaise (soybena oil, water, whole eggs, egg yolks, vinegar, salt, sugar, potassium sorbate (as a preservative), natural flavors, natural color), celery, textured soy flour, carrots, fructose, water chestnuts, water, glucono delta lactone, dextrose, onion, salt, gum arabic or xanthan gum. contains: eggs, soy, tuna. crackers - enriched flour (wheat flour, niacin, reduced iron, thiamin mononitrate (vitamin b1), riboflavin (vitamin b2), folic acid), partially hydrogenated soybean and/or cottonseed oil with tbhq for freshness, sugar, contains two percent or less of salt, corn syrup, levening (baking soda, sodium acid phosphate, monocalcium phosphate), butter (cream, salt), soy lecithin. contains: milk, soy, wheat.